!! !Jaya Sri Muktinath !!! Jaya Sri Shaligram !!! Muktinath is a shrine for Hindu and Buddhists which is located in the Mustang District at an altitude of 3,710 meters at the foot of the Thorong la mountain pass which is part of the Himalayas at Mustang, Nepal. Muktinath Temple is close to the village of Ranipauwa. Muktinath Temple is one of the most famous religious places for the Hindus. Muktinath Temple is one of the most ancient Hindu temples of God Vishnu. The murti is of gold and is tall enough to compare with a man. Within Hinduism, it is called Mukti Kshetra, which literally means the "place of liberation or moksh". This temple is considered to be 106th among the available 108 Divya Desam considered sacred by the Sri Vaishnava sect. There are 108 waterspouts in the backyard of this temple called as muktidhara where frozen water is continuously flowing from the bull head and two kunda (ponds) which is in front of the temple. Taking bath in these 108 waterspouts and two kunda (ponds) believes to bring salvation. The desert beauty of Mustang steals your heart, and it is mesmerizing. Suresh Sharma has earned his Masters’ Degree in Sanskrit grammar and Oriental philosophy. He has also achieved Gold Medal and Nepal Bidhya Bhushand Padak in Philosophy. He is also an Astrologer and expert of Vastushastra by his education, and had travelled extensively for more than 15 years in tourism industry, thus instilling in him the love of travel, of exploration and adventure, of knowing the unknown. Apart from that, Mr. Suresh has done spiritual awakening practices since his childhood age and also led hundreds of spiritual and religious tour in Nepal and India. He is also appointed in some religious societies and has played an important role in promoting spirituality and religion. He has been involving in Muktinath Yatra Pvt. Ltd. as a Marketing Director since 2006 A.D. Besides that, he is the Chairman of World Vegan Organization, founder vice-president of Nepal Vegetarian Association and co-coordinator of Asia Pacific Vegetarian Congress and Vegetarian Festival in March 2018 Nepal. He has done many contributions to make the connections to the international vegetarian organizations and for some years he has made good affiliation for Nepal Vegetarian Association to IVU, APVU and some other organizations. He is strictly against the animal violence and would like to build the beginning of non-violence and peaceful society by promoting veganism in Nepal. Also he has a dream to make Nepal as the best vegan destination of the world. Therefore, he has been involving in different social welfare activities and working hard to make his dream come true. Day 02: Jaal Narayan Darshan & Fly to Pokhara. Day 03: Fly to Jomsom, drive to Kaghbeni & Puja patham. Day 04: Drive to Muktinath & Puja Archana. Day 05: Special puja in Muktinath. Day 06: Fly to Kathmandu via Pokhara & Sightseeing. Day 07: Temple & Cultural tour in Kathmandu. Day 08: Fly back to your home. Arrival in the Tribhuvan International Airport then transfer to hotel, check in and free time for rest at the evening. Briefing about the trip and some Pravachanam about Nepal Mahatyam by Suresh after that dinner . Overnight stay in Kathmandu. Early in the morning we will go to Jaal Narayana (Budhanilkantha / Sleeping Vishnu) temple. We will have a Panchamrit Puja – morning Aarati Darshan, after that we will do samuhika (together) Vishnu Sahasraname Parayanam. 1008 Bhagwan nama chanting (Japa) then drive back to hotel, have a breakfast then drive to the airport for fly to Pokhara. Pokhara sightseeing – Gupteswor cave, Devi’s fall, Barahi darshan by boating. In Bindabasini Mata temple Japam, some Pravachanam about Muktinath and Shaligramam Kshetram. Overnight stay in Pokhara. Budhanilkantha Temple is located at the base of the Shivapuri hill, at the northern side of the Kathmandu valley. The temple is also known as mystical Budhanilkantha temple or Narayansthan temple. ‘Budhanilkantha’ literally means ‘Old Blue Throat’.The temple is dedicated to Lord Vishnu. Lord Vishnu has many incarnations. One of them is the Narayan, the creator of all life and the god who rests on cosmic sea. The 5m-long image of Vishnu as Narayan was created in the 7th century from one huge piece of stone. This image is impressive and the shrine is one of the most important Vishnu shrine in the country. It was sculpted during the Licchavi period, probably somewhere outside the valley, and laboriously dragged here. Narayana lies peacefully on a most unusual bed: the coils of the multiheaded snake, Ananta or Shesha. The snake’s 11 hooded heads rise protectively around Narayan’s head. Narayan’s four hands hold the four symbols of Vishnu: a chakra disc (representing the mind), a conch shell (the four elements), a mace (primeval knowledge), and a lotus seed (the moving universe). Vishnu is supposed to sleep through the four monsoon months, waking up at the end of the monsoon. A great festival takes place at Budhanilkantha each November, on the day Vishnu is supposed to awaken from his long annual slumber. The sleeping Vishnu image, which lies in a small sunken pond enclosure, attracts a constant stream of pilgrims and devotees from all around Nepal and India. Only Hindus are allowed inside the temple. Others can get unobstructed views from the fence surrounding the enclosure. Bindhyabasini Temple: It is one of the oldest temples in Pokhara valley. It is dedicated to Goddess Bhagavati. Bhagavati is a popular deity which can be referred as Hindu Goddess like: Durga, Kannaki, Parvati, Saraswati, Lakshmi and Kali. Early in the morning fly to Jomsom then we will drive to Kagbeni. After reaching Kagbeni we will do hotel check in, after that Krishna Gandaki snan or prokchyananm in sangam –Krishna Gandaki temple Darshan, Maa Krishna Gandaki Aradhana (pitri sharddha - who lost their parents) Mulamantra Japa. Vishnu Shasranama Parayana, we will do special Aradhana of Shaligrama and Krishna Gandaki. We will search Shaligrama in Kaligandaki River. In the evening Muktikshetra Mahatmyam and Bhagwan nama Sankirtan and some Meditation. Sri Saligrams is considered the direct symbol of Lord Vishnu. They are found only in Mukti kshetra and Damodar Kunda (north-west of Nepal / north from Muktinath & Kagbeni). According to the religious text of Devi Bhagwata and other scriptures to kill demon Jalandhar Lord Vishnu have to destroy Sati Brindha's sati dharma. When he did that Sati Brindha gave four seeming desecrations to Lord Vishnu to become stone, grass, tree and plant. To wash away this reaction Lord Vishnu took four avatars (incarnations). He became stone (Sri Saligram) grass (kush) tree (Pipal) and plant (Tulsi). Since this time the Saligrams are considered to be most auspicious to behold and to worship. The worshipper knows no fear and by Sri Saligram's mercy the worshipper is blessed to attain all desirable things; worldly comforts, good wife, good sons, good health and wealth etc. It is all by the blessings of Lord Mahavishnu that His pastimes are being served. It is an excellent service for devotees of Lord Narayana. Early in the morning we will do meditation of Shaligrama Bhagwan then do Puja Archana after breakfast drive to Muktinath. This day we will do Muktinath Mahatmyam and Vishnu Shasranama Patham and Muktinath Darshan. Overnight at Muktinath. This is very important day for us. First we will do Tirtha Snanam in Muktidhara with Sankalpa – 108 water spring then we will do special Archana of Sir Muktinath Perumal, Vishnu Sahasraname Patha, Mulmantra Japa, Hawana and then Alwar Aradhana. After lunch drive back to Jomsom. Free time for Jomsom drive. Evening we will chant Namasankritana Pravachana. Overnight stay in Jomsom. Muktinath; eastward from the famous Damodar Kunda, the Gandaki-irrigated land of Muktinath lies on the lap of the great Himalayan series consisting Neelgiri, Annapurna and Dhawalagiri mountains. One among eight Bhubaikunthas; the earthly place of heavenly bliss- the holy shrine of Muktinath is located at the altitude of 3,749 meters and at 18 kilometers away from Jomsom, the district headquarter of the renowned tourist destination Mustang in mid-western Nepal. Muktinath shrine is pagoda shaped temple standing atop the hill dedicated to Lord Vishnu. Consorted by the Goddess Bhuneela, the Lord reigns supreme not only in the heart of millions of pilgrims who visit the shrine but also in the Holy Scriptures, which abound with his pious description. Mukti Kshetra is known in the world both as the abode of the Lord Muktinath -the Liberator- and as the origin-point of the world-sanctifying stream of Muktidhara. Just like the sun liberates the universe from the abysmal darkness and sustains it through the life-nurturing rays, so the Lord Muktinath through His concrete and majestic presence in the temple liberates the devotees from destitution, misfortunes, sins and earthly bonds, and nurtures with a raison d’être- a sense of purpose in the lives of the spiritually dried, psychologically dismantled, economically devastated and physically frail people. Lord Muktinath is believed to dwell in miniature form in Mukti Kshetra itself whereas beginning from Damodar Kunda down to Triveni in Nawalparasi district is believed to be the body of the Lord in His macrocosmic form. As a result, the terrain beginning from plains of Nawalparasi along the bank of Gandaki River up to the temple in the Mukti Kshetra is hailed as the holy land. The land is also believed to be the place of penitence of Panini, Savant Shringee and chaste Ruru. In addition to the 108 attractive waterspouts behind the temple, there is another temple in the proximity of the Mother Jwala (Goddess of Flame), which is known particularly for the miraculous flame of burning fire inside water. Besides, the shrine is also noted for the availability of the idols of much talked-upon deity Shaligram. There are a number of people belonging to different religions, sects and communities who wander hither and the thither in the hope of attaining perennial peace and salvation or Mukti. However, the one and the only shrine in the world which promises a perpetual salvation or Mukti is, as suggested by the name itself, Muktinath. 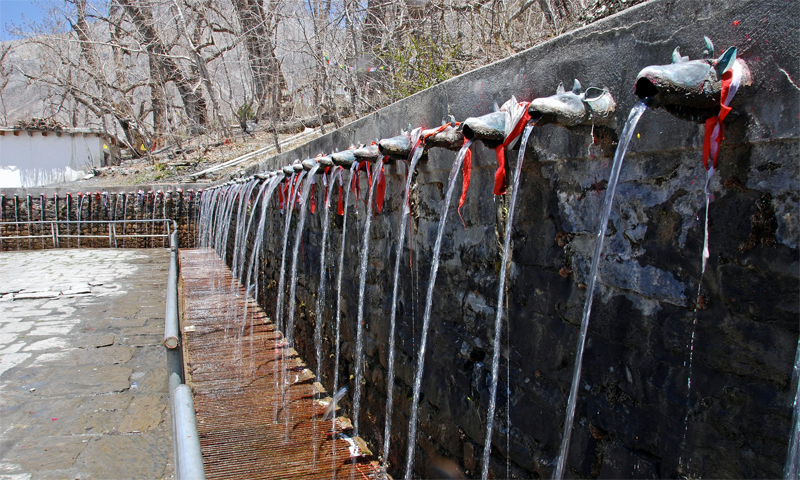 Because of these features, Muktinath has been for several decades a favorite pilgrimage destination in the world. Early in the morning fly to Pokhara and also fly to Kathmandu in immediate flight. Sightseeing in Kathmandu (Swoyambhunath and Kathmandu Durbar Square). Darshan of Pashupatinath at evening Aarati. Overnight stay in Kathmandu. Pashupatinath Temple is one of the holiest temples in Nepal. The Pashupatinath temple is considered as most important Hindus temple in Nepal. Hindus people are bathing ghats and other purposes. It is imagined that to die and to be cremated here will release one from the cycle of repeated birth and death. Pashupatinath temple’s existence dates back to 400 AD. The ornamented pagoda houses the sacred Linga or phallic system of Lord Shiva. Thousands of pilgrims from all over the world come to pay homage to this temple that is also called ‘The Temple of Living Beings’. Inside the temple Lord Shiva is available which are four faces of the Lord Shiva are. In this temple only Hindus are permit, Non Hindus cannot enter most these temple and this is strictly strengthen. The Pashupatinath Linga has four faces and fifth invisible one is said to be on top of the others. The recent of Linga date back to the fourteen century. The main festival of the year is Mahashivaratri. It lies between Februarys to March. Pilgrims come from all over the Nepal and India. The busiest time is from 7am to 10am and 6 pm to 9 pm. Aarati time, when lamps and other items are offered, are the busiest times. Ekadashi, the eleventh day after the new and full moon day, are also usually busiest days. Another festival is Teej it is in August; thousands of women visit the temple to bath in the holy water of Bagmati River. Because this Ritual is meant bring a long happy marriage, many women dress in red saris, which are traditionally worn for wedding ceremonies. Full moon and new moon days are also considered auspicious to visit the temple. After breakfast drive to Sri Panchamahalaxmi Muktinath temple, Changunarayan temple, and Doleshwor Mahadev darshan. Drive back to hotel and free time for shopping. Overnight stay in Kathmandu. You will be free till your flight time. We will drop you to Kathmandu airport two and half hours before of your flight time. - - All accommodations on twin sharing basis in 3 star standard hotel in Kathmandu Pokhara and best available hotels in Jomsom, Kagbeni & Muktinath. - - Acharya Suresh Ji from arrival to departure. - - Daily pure vegetarian breakfast, lunch and dinner. - - Mala, Gaumukhi, and Muktinath Prasada. - - All necessary goods for Puja, Patha, Archana, Aarati etc. - - Pashupatinath special puja tickets and arrangement. - - Budanikantha special puja arrangement. - - Daily Prabachanam of Mukti Keshatra and Shaligram Mahatmem. - - Entry fees of sightseeing spots and boating in Phewa Lake. - - ACAP / TIMS permit fees in Jomsom. - - All necessary AC road transportations during trip. - - Sightseeing in Kathmandu & Pokhara. - - Airfare from Kathmandu to Pokhara to Jomsom and return. - - Jomsom to Muktinath jeep / bus and return. - - Expenses of personal nature. - -Things not mentioned in the above itinerary. - -Mountain flight INR 8,500 for Indian nationalities and USD 210 for foreigners. - -Tips for guide, driver and others. - Note: Above cost is only applicable for this itinerary. If situation goes beyond our control like natural disaster, political disturbance etc. cost and itinerary may change according to situation through negotiations.